You have Onelife. We’re here to help. Search below, explore the map and find the gyms near me. Our personal training programs are the best in the industry! 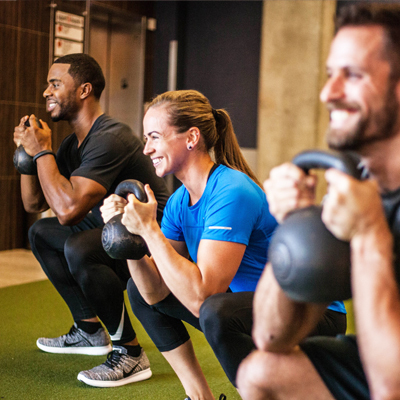 At Onelife Fitness, our Certified Personal Trainers specialize in different areas of fitness such as athletic training, weight loss, rehabilitation, beginner, youth, pre-natal, post-natal, weight gain, endurance, bodybuilding or just toning up. Z4 is the ultimate workout combining intervals of cardio and functional training movements in a fun and motivating group setting, designed to help you burn 500-1000 calories in one session! By utilizing heart rate zone training during your session, you’re guaranteed to reach new levels of fitness. sports injuries. Search our Onelife Fitness VA, MD, GA gyms for the Explosive Performance program near you. Who knew fun and fitness could be so refreshing? At Onelife Fitness, you can take swim lessons, get healthy with aqua aerobics, compete on swim teams, take family swims, and more. Jump on in, it's great for everyone in the family. Nurture your mind. Change your body. Improve your strength and balance. Find your inner peace. Our total-body wellness programs will help you unwind and relax. Namaste! “Not only have I lost weight and improved my body tone, I feel very good about myself. I look forward, everyday to coming to Onelife. Hit the hardwood for a fast, fun way to get your heart pumpin'. Play pick-up games, join a league or just shoot around for fun. Choose a gym with basketball or download a schedule and start shooting hoops today! “I am in the best shape of my life and I've built muscle and strength. I FEEL GREAT!!!!!! Welcome to our Onelife Fitness - Kid's Club. We are proud of our facility, and our Kid's Club playroom. It is our mission to provide quality childcare in a safe, clean, and welcoming environment while you enjoy the full benefits of our workout facility. “When I started out in June of 2009, I weighed 250 pounds. By October 2010, I weighed 145 and have maintained that weight since. In total I've lost over 100 pounds and in 2011, I became a certified personal trainer at Onelife Fitness." 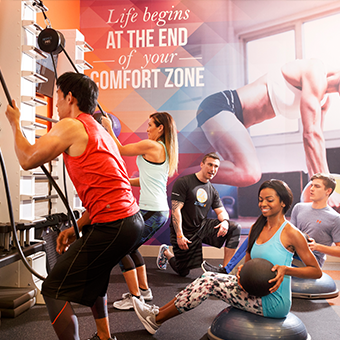 At Onelife Fitness, we pride ourselves on providing the Ultimate Fitness Experience to every member every time. With that goal in mind, we've built the nicest health clubs in the industry to offer the best in health and fitness to every body. Whether you are brand new to fitness or are training for your next triathlon, Onelife Fitness offers the facilities you need to achieve the goals you want! Search gyms near me to find the closest Onelife Fitness. You have one life to live, so make it count! Tag us using #IHaveOnelife in your pics on Instagram for a chance to be featured on our social pages.